This year marks 150 years since the end of the American Civil War. For many, the Civil War exists only in textbooks and Ken Burns documentaries. It can be difficult to connect to the brave souls who actually fought “The War Between the States.” Unlike World War II and Vietnam, we no longer have an opportunity to speak to those who served. To further humanize the blood and gore that we used to read about in freshman history class, we sometimes need a personal link to someone who experienced the battles between North and South. One of my connections to the war is via the unlikeliest of people: a Canadian-born teacher who entered this world more than half a century after Robert E. Lee surrendered at Appomattox. You are a stranger to me, but you may have heard of me. 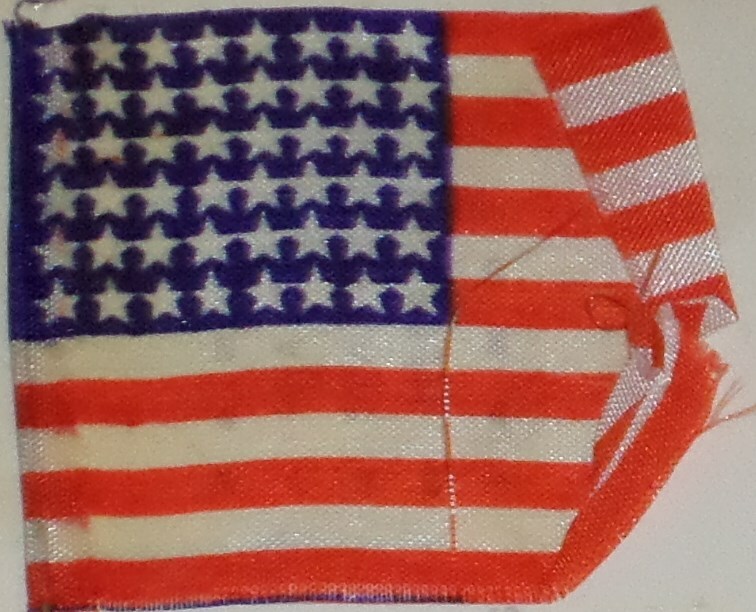 I have lived in good old Iowa for 86 years; I have the honor of placing the first flag over the first school house in Wyoming IA 48 years ago; thinking the one you have has seen its best days; I am sending you a new one along; may it wave over the land of the free and the home of the brave. I am sending you a picture of an old man 97 who like the flag has seen his best days. Going off only his business card, M.H. Morse already seems like an impressive man. But he wasn’t just some random statistic from a war that led to an estimated 620,000 deaths. 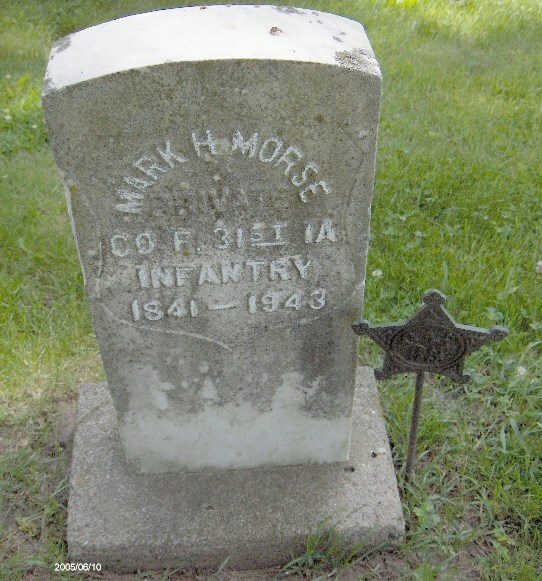 According to his obituary, Mark Harrison Morse was born in 1841 in Bradford, New Hampshire, a town incorporated just nine days after the adoption of the Constitution. At the age of 11, Mark and his family migrated to Iowa and settled on a farm east of Wyoming. 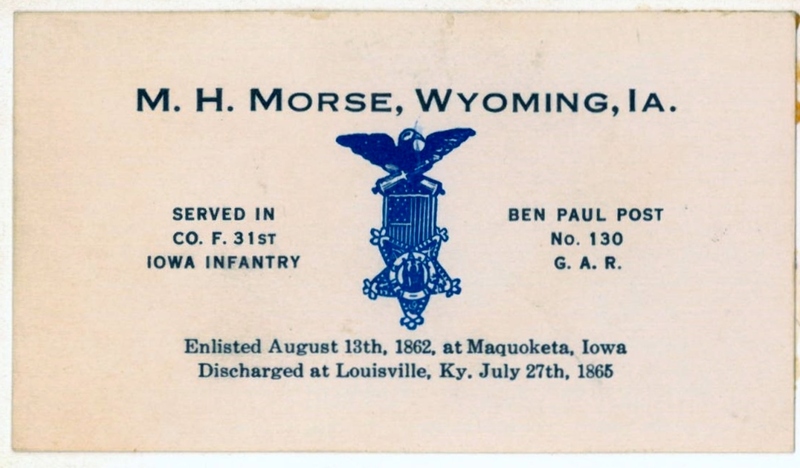 Like many Iowans of the time, Morse enlisted when his country needed him. 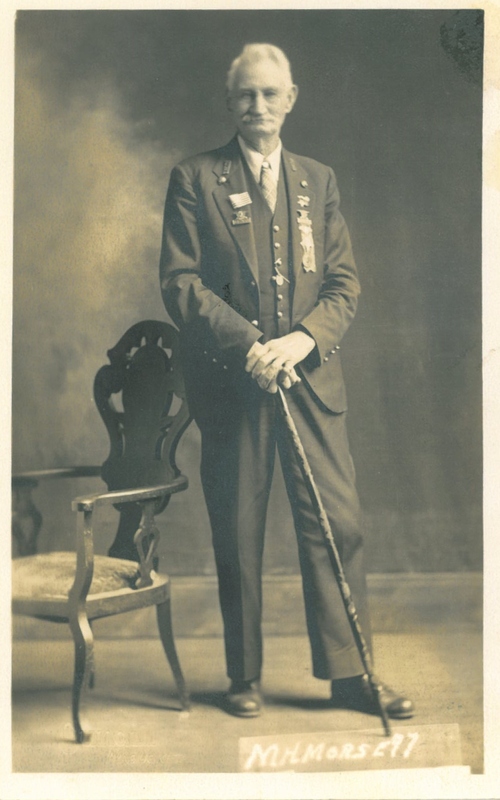 He joined the 31st Iowa Infantry, Company F, in 1862 and gave three years of active service. He fought in the battles of Lookout Mountain and Missionary Ridge, but returned to Iowa unscathed after being discharged in July of 1865. 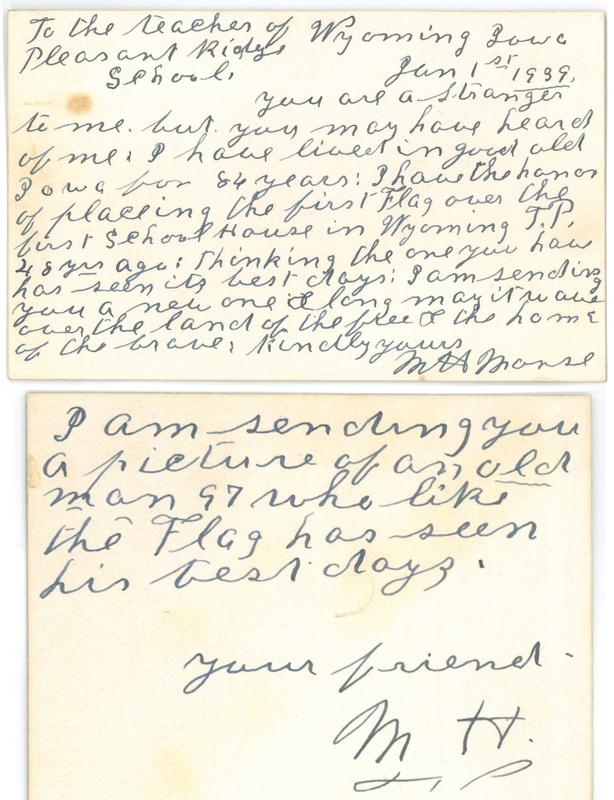 Morse’s obit mentions that he often told Civil War stories to school children and would give them each a small flag afterward. One of those flags was stapled to the letter he sent my grandma. After the war, Morse entered marital bliss and was wed to his wife for 60 years before her death in 1927. Morse lived another 16 years after that, passing away on Christmas Day 1943 at the ripe old age of 102. The significance of this is that his death marked the end of an era; he was the last surviving Civil War vet in Jones County, Iowa. Morse’s headstone in the Wyoming Cemetery, Wyoming, IA (Photo courtesy of Ken Wright). I don’t know if my grandma ever met Mark Morse. Considering that Wyoming was (and still is) a small town, it’s likely their paths crossed at some point. 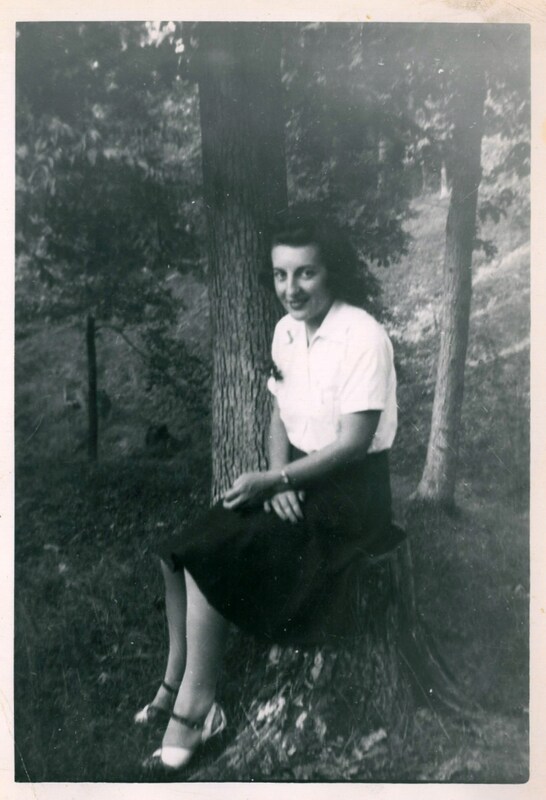 Regardless, it seems to me that he must have had at least a nominal impact on her; that letter could have been thrown away immediately, but instead it was tucked inside a photo album for safe keeping all these years. Well done! People fail to realize that in whatever community you cane from in Iowa everyone knew someone who died in the war. I have come across township markers with over 75 dead listed in a single township. These are people everyone at the time knew, they went off to war and were literally disappeared from the earth in marked and unmarked graves likely never to be seen again by family and friends . The sacrifice was well understood by all, and there weren’t idiots floating about thanking you for your service, who literally have no clue what they are talking about. Thanks Steve. It’s mind-blowing to realize just how many people were affected by the war. I think I saw a stat that said 2% of the American population died in the war. And of course, Iowa was one of the states that led the way!